***IMPORTANT*** DUE TO THE POPULARITY OF THESE, THEY MAY PERIODICALLY RUN OUT OF STOCK. THIS WILL RESULT IN A DELAY IN SHIPPING TIME****Normal shipping time is 7-10 days. 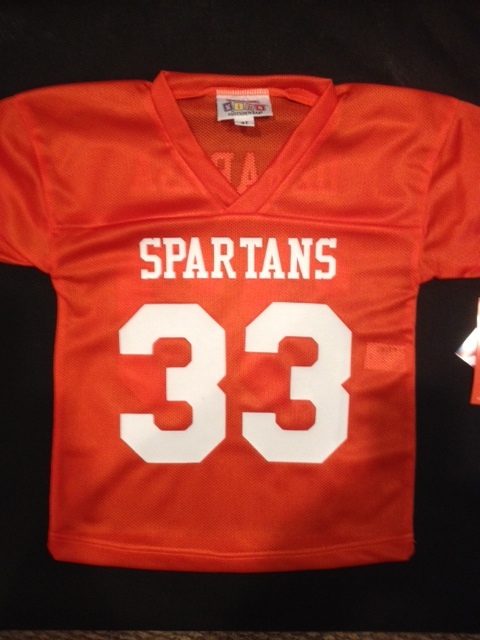 Little Legends Sports now offers toddler football jerseys for your future football player. Available in sizes 2T, 3T, or 4T, and YS. these full length nylon mesh jerseys are designed exactly like jerseys the "big kids" wear. Colors available are Red, Royal, Kelly, Black, Purple, Maroon, Orange, Navy and White Personalization Available. **PLEASE NOTE: WHEN ORDERING BLANK JERSEYS, PLEASE ENTER "LEAVE BLANK" IN ALL FIELDS THAT REQUIRE AN ENTRY. ** Please allow 7-10 days for shipping.